Salmon is considered one of the most delicious salmon. You can cook a variety of culinary delights, one of which is grilled fish with the marinade. This dish has its own taste from what is cooked in the kitchen, and the marinade gives it savory taste, impossible to forget. Some people consider salmon a delicious oily fish, which needs no marinade. In principle, it is, however, salmon is much tastier and more interesting, if you marinate it before grilling. Usually the result exceeds all expectations: fish meat becomes tender, and its flavor is delicious. Just fifteen minutes of marinating, and you will receive a fragrant and juicy shish kebab from a salmon. Marinade salmon need a gentle preservatives that will not soften its flesh to such an extent that the fish will fall apart on the grill. To prepare the traditional marinade with olive oil, you need to take 500 grams of salmon, four tablespoons of olive oil, five or six olives, half a lemon, bunch of green dill and salt to taste. Lemon juice to squeeze into oil, and olives and dill finely chop and mix thoroughly. The fish is salted and spread on the marinade for fifteen to twenty five minutes. Marinade recipe for salmon in Italian is a similar composition, but it still added 200 grams of white wine, and three or four tablespoons of soy sauce. It's a little different from the first for their taste, but also gives grilled salmon a unique taste. If you use any condiments, it is important not to overdo it with them, as the tender meat of the fish is very easy to spoil. For a delicious marinade of herbs and sour cream, which will emphasize all the flavor notes of salmon, we need 500 grams of fish, one tablespoon cream, one lemon, one onion bulb and greens and salt to taste. The onion and the vegetables should be finely chop and squeeze lemon juice. The mixture is added salt and sour cream. The seasonings in this recipe it is advisable to use not to spoil the taste of the future of barbecue. Also do not use the marinade for salmon vinegar, which can greatly soften its meat and break it homogenous structure. Put the salmon in the marinade for twenty five to thirty minutes, during which she soaked components, and will acquire a delightfully delicate texture and juiciness and a mild spicy taste. 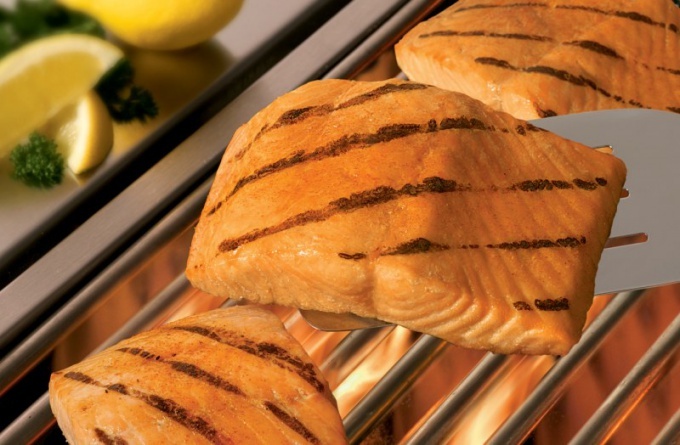 There are many different options for preparation of fish marinades, however, the above recipes are the most popular for marinating the salmon on the grill. With their help, you will surprise guests with their culinary skills, a secret which is quite simple.